Dramatic moments here at the climate talks in Warsaw. A Polish Government reshuffle saw their environment minister get the order of the boot. Poor Marcin Korolec has also been chairing this Conference of the Parties (Cop) with mixed success. But he didn't lose his post because of the glum state of the negotiations - ironically his political bosses weren't sure he was the right man to handle shale gas in Poland. And I thought fracking was supposed to create jobs? The conference was also "rocked" by a walkout by delegates from developing countries. They were angry about the crucial issue of loss and damage and during a very late session, they walked out, raging with indignity into the cold Polish night. By other accounts, several negotiators did actually walk out, but only to catch the last bus home! This group of countries, called G77 plus China, in the language of the Cop, were deeply incensed by the richer countries simply refusing to countenance a new arrangement on loss and damage that would see them legally on the hook for the impacts of rising temperatures. In the words of EU climate commissioner Connie Hedegaard this concept is a red line for Europe. "We cannot have a system where there will be automatic compensation whenever severe weather events are happening one place or the other around the planet, you will understand why that is not feasible," she said. But it wasn't all fractious infighting about mind numbing details. 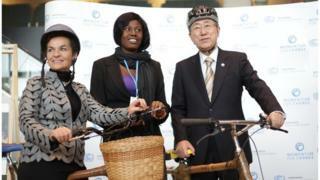 UN Secretary General Ban Ki Moon put on a crash helmet, not to survive the brickbats of angry negotiators, but to steer a bamboo bicycle around the conference centre. Mr Ban was highlighting a project called Momentum for Change, that includes the Ghanaian bamboo bicycle project. This company made 800 of these bikes last year, which not only benefits the environment by using bamboo but gives jobs and crucial transport to villagers in many parts of Africa. Mr Ban had opened the ministerial segment of this meeting yesterday to the strains of some noodly jazz laid on by the Polish government. In a surreal scene, a Ukranian artist drew powerful climate-related pictures in sand that were projected on the big screen - some wag suggested that given the attachment of Poland to anthracite, perhaps she should have used coal dust instead. Mr Ban tried to gee up the participants by telling them he had previously been to a successful climate meeting in Poland in 2008. Perhaps it wasn't the right image. The car crash that became the Copenhagen Cop in 2009, had really started to unravel the year before in Poznan. Many fear that Warsaw will foreshadow similar problems when the climate bus pulls into Paris in 2015. Well at least Mr Ban didn't tell us, for the umpteenth time, that the heat is on.